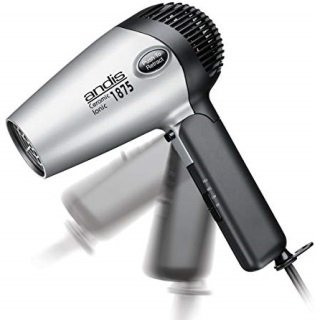 To look your best, it’s important to have a quality hair dryer. A quality styling tool absolutely does not have to cost you hundreds of dollars. You don’t want to have to head to a salon every few days for a quality blowout, either. A good, quality blow dryer can save your wallet. It’s definitely possible to get a fantastic hair dryer for a minimal budget. For hair dryers, you have to balance the cost versus the features. That’s where you’ll find the most value. We’ve picked dryers that have great features like a strong motor or high speeds. You can decide how much you’d like to spend and the features you want. For example, if you have curly hair, you’ll want the dryer with the best diffuser. For straight hair, you’ll want to add shine. That means a dryer with negative ions. All the work has been done for you. 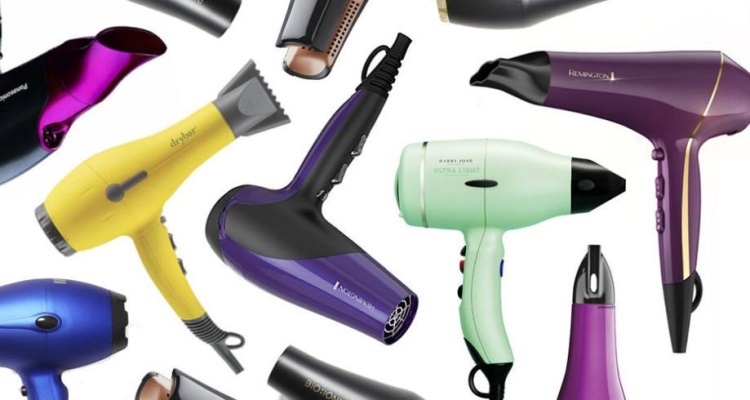 We have a guide as well as the top 7 cheap hair dryers reviewed. 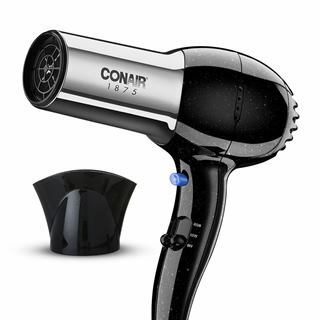 What Should You Know Before Searching for the Best Inexpensive Hair Dryer? 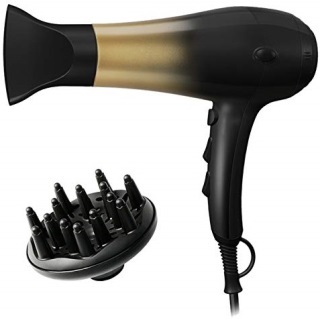 This hair dryer is made with Nano Ionic Technology. This kind of technology will give your hair the smoothing nature of negative ions. While negative ions sound like a bad thing, they’re meant to counteract the positive ions. Those are in frizzy, dry hair. The Nano Ionic features in this dryer will make your hair healthier. It has a powerful 1875w motor. With this motor, you can get the upper end of the speed settings. There are 2 settings for speed; soft or fast. The strength of this wind speed will dry your hair quickly. That speed can be combined with any of the 3 heat settings. Along with all those heat and speed options, there’s a cool shot button. This is a great way to set your style once it’s blown out. It seals the cuticle of your hair. It’s a great way to avoid extra heat in your hair. With your style set, flat ironing or curling happens faster. That saves your hair from overheating. This dryer comes with attachments. There’s a diffuser for saving your natural curls. Instead of blowing them straight with heat and speed, you’re preserving those curls. There’s also a concentrator. That allows for direct styles to be given through the dryer. This cuts out the need for a second tool for styling. The wattage of the dryer is high at 1875w. A high-wattage dryer cuts down on your drying time. Instead of spending 15, 20 minutes of drying, you can do it in 10 minutes. Cutting time out of your hair drying has a few benefits. Your hair will be healthier. It won’t be exposed to heat as long as with other dryers. When you use your dryer less, you’re getting more years out of it. These motors are long lasting. Even though the dryer’s motor is strong, it is still a low-noise machine. The dryer weighs around 1 pound. This won’t give you any arm fatigue even if you spend a long time drying your hair. The buttons are in a place where they can be bumped. You’ll have to take care when holding the dryer. 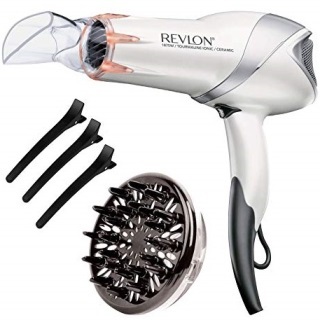 This hair dryer from Revlon is made with tourmaline. This ionic technology will combat positive ions. You’d think that positive ions would be a good thing. They are not. They’re in dry, frizzy hair. The negative ions of the dryer will cancel out the positive ones in your hair. There’s infrared technology for the heater in this dryer. Infrared heat will be gentle on your strands. It’s great for hair that takes longer to dry. Infrared heaters will heat hair from the inside out, too. This means more moisture in your hair as well as healthier hair. In this dryer, you’ll get two settings of heat. There’s a high speed and a low speed. With the high speed, you have an 1875w motor behind it. That will dry your hair much faster than your old dryer. There are two heats; warm and hot. This will give you better control of the heat and speed. With this dryer, you’re getting accessories. There are two attachments included with this dryer. There’s the concentrator for directing the heat and power at certain areas. This gives you more control over your style. There’s also a diffuser for curly hair. It comes with hair clips, too. This dryer from Revlon is sleek looking. That’s the first thing that will catch your eye. Even the attachments are sleek. The concentrator is clear, so you can see through it. The diffuser has some interesting materials, too. The tourmaline of this dryer is some of the latest technology in hair dryers. It’s usually something you would find in high-end dryers. 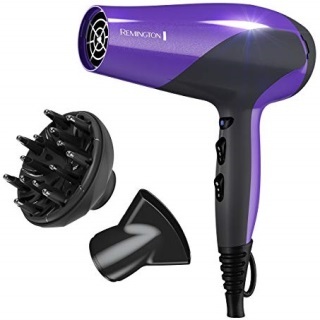 This hair dryer produces negative ions to really moisturize your hair. You will spend less than $50 on this dryer, too. That’s a huge value for the price in the tourmaline alone. Included with the accessories are 3 sectioning clips. It’ll help you separate your hair for drying. It’s always best to start with the hair underneath. You can also use them for styling. The handle’s shape and texture don’t work well for people with wet hands. It’s important to be sure your hands are dry when using. That’s good advice for any electronics. This Conair dryer has a tourmaline ceramic interior. That inner part of the dryer will emit negative ions. Those negative ions will make your hair soft and silky. That’s because they combat the positive ions that are in dry, frizzy hair. Your hair will be healthier than when you started. It’s a full size dryer with 3 heat settings. There’s a hot setting, one for warm air, and a cool setting. You’ll be able to choose your heat setting then choose the speed; high or low. Any combination is personalized based on your hair health. The speed setting relies on the 1875w motor. That motor will give you a blast of air no matter what temperature you choose. You can pick the warm setting on low for hair that might need more care. Your hair might need hot and high to dry thoroughly. Experiment with the settings. The dryer comes with extras and accessories. There’s a cool shot button for locking in your style. There’s a concentrator for delivering smooth hair. It can be the first step in styles like glass hair. This dryer is only slightly over one pound. That won’t tax your arms or hands when you are drying your hair. It’s a beautiful-looking styling tool, too. It’s covered with chrome and black diamond. It’s an interesting color that looks like diamonds or stars. You’ll get shinier hair with an ionic dryer with tourmaline and ceramic. It’ll reduce the chance that your hair could become damaged. 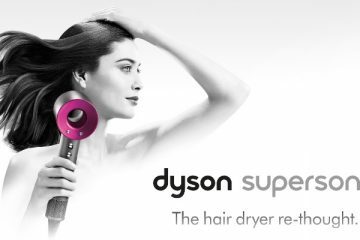 Many people have noticed healthier hair when using this dryer. It has helpful additions that don’t cost extra. This dryer has a cool shot button. That will help you lock in a style before your next tool. It keeps the hair healthier by locking in the cuticle, too. The cord is only 5 feet long. You’ll need to be close to the socket when drying your hair. The Remington dryer has ionic technology. That comes from the tourmaline and ceramic materials. The materials emit negative ions. Negative ions sound bad, but they’re perfect for combating positive ones. There are positive ions in dry, frizzy hair. Along with ionic technology, there are other pluses to this hair dryer. It has 3 heat settings. You’ll get a cool shot button plus the 3 heat settings. It gives you a variety of options. There are also 2 speed settings. The high speed setting is helped by the powerful 1875w motor. It’ll give you all the power you need to dry hair quickly. The motor wattage is one that will last a very long time, too. It’ll be years before you need to replace this dryer. It comes with loads of extras like a concentrator and diffuser. They help you create styles specific for your hair type. The dryer also comes with a removable filter. You can ensure that the air blowing is clean and free of dust. The biggest part of this dryer is the ability to produce negative ions. It has great materials for a modest budget. You’re getting ceramic and tourmaline for reduced dryness. Your hair can be healthier than when you started applying heat. It has the ability to provide 3 heat options. That’s for drying and styling. You can perform all your styling with one tool and the right brush. The cool shot button will lock your style in place for hours. The accessories and wattage power of the dryer are impressive. You’re getting a great dryer for a modest amount of money. You’d expect these features on an expensive dryer. The cord of the dryer isn’t that long. You’ll have to consider an extension cord or sitting near the outlet. This is a travel dryer that you can take with you anywhere. There’s much to love about this styling tool. It has nano titanium inside, which will give you negative ions. Those ions will fight with the positive ones in your dry hair. It’ll moisturize and bring about healthy hair. For a compact travel dryer, this has all the heat and speed you want. The dryer has the ability to go high heat or low. It has two speeds as well. This gives you the variety you need to control your style when drying. It also comes with a concentrator for directing the air for your specific style. The dryer has a way to stay clean. There’s a removable filter for cleaning the dust and dirt. The filter will ensure that dust stays out of the motor. For your dryer to last for years, it needs to be kept clean regularly. When traveling, you need to consider the voltage of the country. Visiting another country means that they won’t have the same voltage as your own. This dryer can handle dual voltage with a simple turn of a knob. No attachments or extras necessary. It’s a lightweight dryer with a folding handle. It’ll easily fit into your travel bag. This convenient travel dryer has a folding handle. This makes it even more compact. The shortened nozzle makes it easy to pack, too. Another great feature for travel is the dual voltage. You don’t need to buy a converter. The voltage can be changed with a small knob on the dryer. Even though it’s a small dryer, it has great features like a bigger model does. You won’t have to sacrifice styling while you travel. The dryer has nano technology. It emits the negative ions needed for smooth, shiny hair. There’s also a concentrator attachment. You can have a terrific blowout when you’re on vacation. There’s no reason you have to rely on the hotel’s inferior dryer – if they even have one. This travel dryer is convenient, compact, and easy to use. Due to the small size, the back intake can pull in your hair. Keep it carefully away from hair when drying. 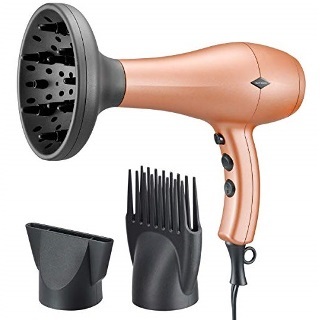 This is a compact hair dryer that you can take on vacation or a work trip. It fits easily in your luggage. While it’s compact, it has the features of a bigger dryer. The ions from this ceramic and tourmaline heating element nourish hair. It creates shiny hair that looks healthier after drying. The motor is 1875w. That’s the kind of wattage you’d find in a larger dryer for your home. The wattage can be taken on the road with this smaller dryer. In fact, you might want to use this at home instead of a large bulky dryer. The motor gives you 3 heat settings and speed settings. At the low speed, you’re getting low heat. Medium heat and medium speed are together as well as high heat and high speed. It also has a cool shot button. You don’t have to fumble with numerous buttons while trying to get ready in the morning. It’s a dryer with many good travel features like a folding handle. It has a retractable cord, too. Along with these features, you’re getting a concentrator for precise styling. You’ll always look your best even when you’re traveling. The most impressive thing about this dryer is the motor wattage for the price. You’re paying a reasonable price for a styling tool with an 1875 wattage motor. That’s a full-power motor that you’d see in a more expensive hair dryer. It’s meant to save space. If you’re not traveling, you can still benefit from the design. It’ll fit easily in a drawer in your bathroom. You won’t have to leave it hanging in full view. It’s compact and easy to put away. The speed and heat buttons are easy to use. There is also a cool shot button for sealing in the style. These are all features you’d find in a much more expensive hair dryer. The small size of the dryer means that your hair could get caught in the back. It’s important to be super careful when drying. The outlet grill on this hair dryer is filled with so much goodness. The grill is infused with tourmaline and nano silver for producing negative ions. As mentioned before, negative ions are great for combating positive ions. They destroy static and dryness. The grill is coated with Argan oil. This oil has vitamin E and other essential oils. It has numerous benefits for your hair. The oil hydrates and protects against heat damage. That’s sent into your hair every time you blow it dry with this styling tool. As far as heat and speed, this dryer has 2 power settings. You can get high or low air speed. There are 3 heat settings. With low, med, and high heat, you can choose the speed separately. There’s also a cool shot button. That button gives you cool and warm choices. This stylish tool is sleek with a lovely color. There are 3 attachments that are cool-looking as well as functional. There’s the concentrator, the comb, and the diffuser. Each of them helps to concentrate the negative ions and Argan oil into your hair. They also create a style suited for your hair style and texture type. This lightweight styling tool looks like it would be super expensive. It’s professional looking and full of great features. There’s a high wattage motor in this dryer that gives off powerful air and heat. You’ll be able to pick the right combination for your hair type. It also has an additional button for a cool shot. It switches between cool and warm. This helps lock in your style. Once you’re finished drying, set your style by locking the hair cuticles with cool air. One of the best things about this dryer is the price and the amount of features. For less than $40, you’re getting all the things you’d expect with a dryer over $100. The attachments alone are great. There are 3 of them for any style you want. With the diffuser attachment on the dryer, it’s a bit unwieldy. It’s not heavy but can be awkward to hold. When choosing a blow dryer, it’s all about the features and the price. In an inexpensive hair dryer, you’re going to have to wade through the features. Learn which ones you absolutely need and the ones that you can live without. The features you choose will be based on the goal of your morning routine. What kind of blowout do you want? The best way to tame frizzy hair is with the materials of your hair dryer. Frizzy hair is full of positive ions. To combat those kinds of ions, you need negative ions. Negative ions come from materials like tourmaline. There are also some in ceramic and titanium if they’re coated. The addition of these materials will raise the price of the dryer. There are elements that will distribute heat evenly. That’s important when drying your hair. If it doesn’t distribute heat evenly, you’ll end up with burnt strands. The hair dryers that distribute heat will have ceramic or porcelain in their makeup. Infrared heaters will also heat gently while distributing the heat. It stays a consistent temperature and will dry hair from the inside. If you have thin or damaged hair, you want to pay attention to this feature. You’re more prone to damage from heat. Don’t forget to add a good oil to your hair. For trends like glass hair or silk waves, the process starts with the right oil of course. It also begins with the right tools like the dryer. You could let your hair air dry, but it’ll be harder to remove curl and waves. For glass or silk locks, you’ll need to purchase an ionic dryer with a concentrator. For trends like curls or waves, you need a dryer with the right accessories. A diffuser is essential for keeping your curls intact. You don’t want them to get blown out and lose their bounce. The weight of the dryer will have an impact on a variety of things. It’ll influence how long it takes you to get ready. If you have to lay it down when it’s heavy, you’ll take longer to finish. Your arms could get tired and numb half-way through the job. This is crucial for those with long hair. It can take 20 minutes to dry your hair fully. Don’t ignore the under parts of your hair. The result will be a bad hair day in the end. Pick a weight that won’t wear on your arms and hands. Dryers with high wattage will blow out your hair faster. The motor has a direct impact on the drying time. There are other elements that will heat the air. The motor is how fast the air is pushed out of the dryer. It’ll cut down on your drying time. That will directly cut down on the amount of heat on your hair. When you cut down the amount of heat, it’ll result in healthier hair. Overexposing your hair to heat can cause serious damage. A higher wattage also means that the dryer will last longer. The motor won’t burn out. These are bonus features that you might need for your hair specifically. You can get a dryer with adjustable heat. This will help with fine hair that needs less heat. It can work when you’ve had your hair colored. Damaged hair might suddenly need a lighter amount of heat. A diffuser and concentrator were mentioned earlier. Another feature that you might need is a cold shot button. It is meant to seal in your style. It can also provide a boost to the shininess of your hair. That’s a great feature for silk or glass trends. 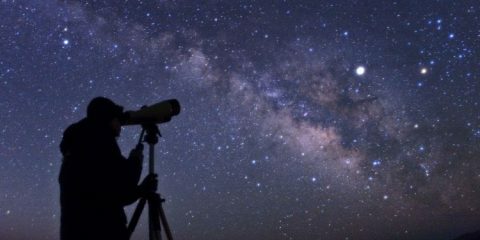 Those with a limited budget, don’t have to worry about features. 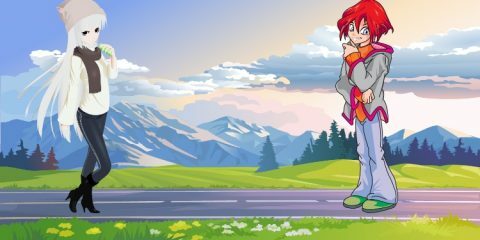 You can have many that will make your trip fantastic. There are compact dryers with plenty of attachments. There are travel dryers with folding handles. 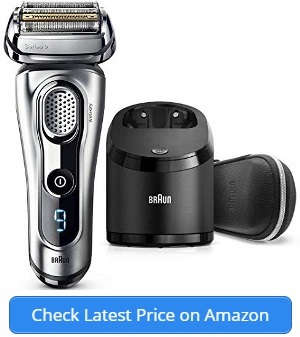 The materials are what you would find in a more expensive hair dryer. There’s no need to spend hundreds of dollars on a dryer unless you want to do that. 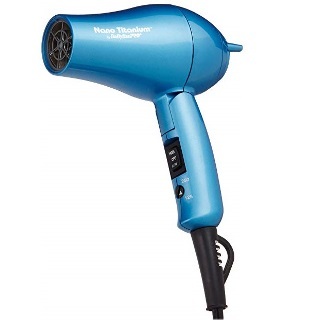 We’ve given you our criteria for a hair dryer on a budget. That includes those features to give you smooth, healthy hair. 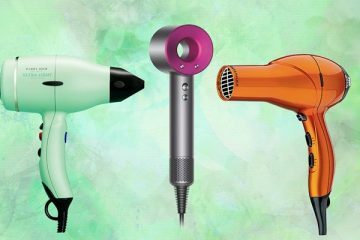 The best cheap hair dryers are on this list. We’ve provided a breakdown of why we think these are the best hair dryers for anyone on a budget. In fact, even if you aren’t on a budget, you’ll find some incredible styling tools here. The inexpensive hair dryers won’t be ones that you’ll have to replace in a few years, either. That makes them an incredible value for your money. There’s no way you could go wrong with one of these hair dryers.